With the use of ultrasound, the technologist visualizes your thyroid gland for any nodules, enlargements, or general abnormalities. Abnormal thyroid glands should be followed up for further evaluation. This screening is important because 1 out of every 13 Americans have a thyroid disorder. Common symptoms of thyroid abnormalities can include: fatigue, weight gain/loss, temperature swings, and difficulty swallowing. *Ultrasound can also find abnormalities that may not be detected by a thyroid blood test. 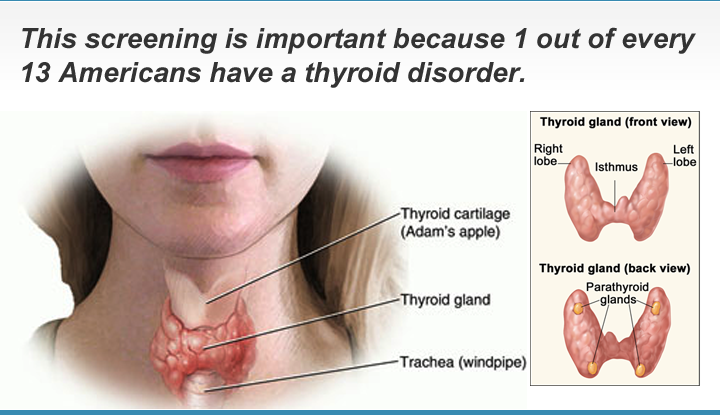 Watch a short video about Thyroid Abnormalities and how we screen for them.